The pound has hit a 14-year high of $1.9938 against the dollar, with many experts believing it will rise above $2 in the next few days. Sterling has been rising against the dollar as the UK's economic performance contrasts with fears of a US slowdown. The trend has been good news for British visitors to the US but has made life more difficult for exporters. The pound was last equal to $2 in 1992, the year the UK was forced to leave the European Exchange Rate Mechanism. The pound fell back slightly to $1.9900 in later trading, while the euro neared its all-time high against the dollar. Inflation data being published in the UK and US on Tuesday could put further upward pressure on the pound, potentially pushing it above $2. With the UK housing market showing little sign of slowing down and inflation well above the government's 2% target, experts predict a further rise in interest rates before too long. In contrast, the US housing bubble has burst in recent months and weakness in the manufacturing sector means that further rate rises there are seen as unlikely. Higher interest rates tend to support a currency by making certain types of investment more attractive to traders. The current situation gives British visitors to the US much more buying power. Leading airlines have reported strong demand for US flights in recent months as people seek to exploit the favourable exchange rate to go on holidays and shopping trips. 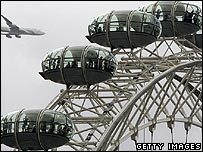 But the situation is worrying the UK tourist industry which is heavily reliant on free-spending US visitors over the summer. 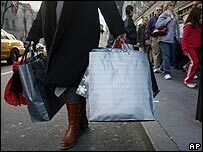 British firms with a large number of US customers are also beginning to feel the pinch. "For casual tourists I think it has had an effect and we are beginning to see a bit of a dip," said Mark Henderson, chief executive of bespoke tailors Gieves and Hawkes. "If it goes beyond $2, it could become quite tough." One City analyst said the strong momentum behind the pound was set to continue. "There is every chance that the higher volatility we are likely to see this week will take us above $2," said Martin Slaney, currency expert at GFT Global Markets.